Tesco continues to progress towards its 2020 goals. Like-for-like (LFL) sales growth and the acquisition of Booker boosted sales by 11.3% to £56.9bn. With ongoing savings helping margins rise to 3.45%, underlying operating profit rose 33.5% to £2.2bn. The shares moved marginally higher on the news. The full year dividend rises 92.3% to 5.77p per share. Tesco's pleased with its progress and we can understand why. It looks well set to hit its target of a 3.5-4% operating margin by 2020. All its major metrics are heading in the right direction despite a ferociously competitive marketplace, with the newly integrated Booker working wonders on sales figures. Tesco is by no means in the clear though. Aldi and Lidl remain a threat and Walmart is willing to offload Asda. A sale, whether to private equity or an existing rival, could mean that brand gets new life breathed into it - and that would raise the prospect of another price war. But CEO Dave Lewis has been busy bolstering the group's armoury. Tesco's launched a new chain of discount stores: Jack's, named after the group's founder Jack Cohen. It's too early to know how this new format has been received but it could give the group a more direct route to compete on price. There's also the shared supply deal with Carrefour that went live in October. That sees two European superpowers joining forces to squeeze suppliers, and it's easy to see how the deal can add value. The income statement looks stronger, with margins and sales heading upwards. Much of the heavy lifting's been done on the balance sheet too. Leverage is back within the target range and a property reshuffle means Tesco now owns, rather than rents, close to 60% of its stores. While there are plenty of hurdles still to clear, overall we think Tesco's recovered well from 2015's nadir. That means focus can shift to the dividend plans. Tesco is targeting paying out half of earnings this year, which would imply a prospective yield of around 3.5%. With plenty of scope for more improvements, profits and dividends could rise, which is encouraging for investors. But there are no guarantees, especially in the cutthroat supermarket sector. Underlying sales in the UK & Ireland rose 16.1% to £44.9bn, boosted by the acquisition of Booker. LFL sales in the core UK grocery business rose 1.7%, with Booker up 11.1%. Underlying margins rose by 0.39 percentage points, and by 0.62 including the extra profits and higher than expected synergies from the Booker deal. That helped adjusted operating profits climb to £1.5bn, up 45.0%. Across Europe, underlying sales fell 4.5% to £6bn, with LFL sales down 2.3%. That reflects tighter Sunday trading rules in Poland, and the decision to scale back unprofitable general merchandise sales. However, lower costs and a focus on higher margin products meant profits rose 56.3%to £186m. Asia remains challenging, with underlying sales falling 4.1% to £4.9bn over the year, dragging profits down 6.7% to £286m. However, LFL trends improved to -3% in the fourth quarter. Retail free cash flow fell from £1.4bn to £906m, but Tesco highlights this is due to a higher tax expense and timing. Payments were delayed last year, with some receipts this year delayed to 2019/20. Adjusted net debt rose from £2.6 to £2.9bn, driven by the cash outflows relating to the Booker transaction. However, total indebtedness fell 0.7% to £12.2bn, due to a lower pension deficit. 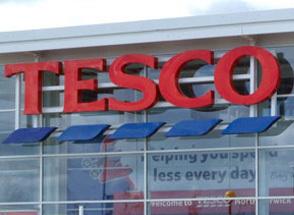 Profits at Tesco Bank rose 16.6% to £197m, with both cards and loans performing well. Hargreaves Lansdown's Non-Executive Chair is also a Non-Executive Director of Tesco.